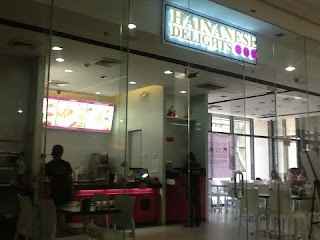 Hainanese Delights is now open in Cebu! Popular for their Chinese style of preparing steamed Chicken known as Hainanese Chicken, this restaurant has found favor in the eyes of many Filipinos looking for new food options. The first branch is located in Robinsons Cybergate Mall, Fuente Circle, at the heart of Cebu City. They are open to serve you seven days a week as soon as the mall opens. Aside from Hainese Chicken, they also offer other rice-based meals such as fried chicken, pork and tofu. I tried the combo meal, Pork Chop Rice and it was good. I especially appreacite the fried rice. It was made in their own style. Aside from great food, Hainanese Delights Cebu also have free WiFi for their customers. Try it by yourself by visiting their store.